This fine mid-summer season calls me into a fresh appreciation of wilderness -- theologically, spiritually, and ecologically. In recent weeks, two pleasant modes of inspiration have reinforced each other to boost into high gear my always-present affirmation of wilderness. My recent summer reading has included Richard Baukham's insightful book, The Bible and Ecology: Rediscovering the Community of Creation, which deals extensively with themes of wilderness and wild nature. And yesterday I was able to immerse myself in contemplation while hiking in one of Colorado's designated wilderness areas. The reading and the hiking converged, making my time on the trail more thoughtful. I'll admit it. I went to the mountains for fun, as a birthday gift to myself -- and with a tinge of proving to myself that The Old Geezer can still do a challenging hike. There is no way that I thought that I was "conquering" the mountain wilderness by making it all the way to Lost Lake (and back!). My enjoyment comes from encountering a setting that is only lightly touched by humans, a vast place that clearly exists for its own sake. Now it is true that the trail I took into the Eagles Nest Wilderness Area is not as pristine as some. The trailhead parking is on the shoulder of an Interstate highway exit ramp, and the first half-mile of hiking parallels the highway, with big trucks roaring up the road to Vail Pass. Most of the day, I could hear the sounds of traffic in the distance. On the other side of the valley, there is a huge ski area, and the highly visible gashes of ski runs cut through the forest were a constant reminder of that mountain's dense and commercialized use. The base of the valley has condominiums and shops lining the fairways of a golf course. I've been to places that are much more remote, but "wilderness" is not just about isolation. Bauckham writes that "wilderness is the non-human sphere." He speaks of "wild nature precisely as non-humanized nature, nature whose value lies not in its adaptation to human use or enjoyment but in its unspoiled otherness." So the contrast across the valley (once I got away from the worst of the highway noise!) was helpful in a way. The ski resort, golf course, and the superhighway were ever-present as symbols of highly-adapted and utilized nature. In contrast, the narrow, steep, muddy trail in the wilderness area seemed like the most minimal adaptation possible for human visitors, with all wheeled and motorized equipment prohibited. 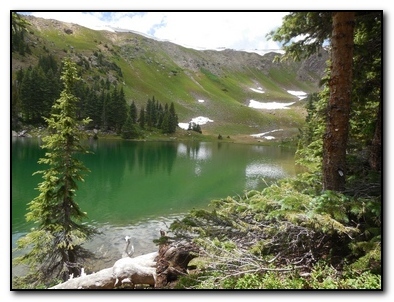 On the north side of the valley, the land that surrounded me -- thick forests, meadows filled with a riot of wildflowers, sparkling mountain lakes (the one to the right is Lost Lake), and snow-capped tundra ridges -- was not ours to claim. It is there for the original inhabitants, the magnificent deer with the large rack of antlers, the chipmunks and birds, the trout. The winter skiers come to a place that is designed for their enjoyment. I was privileged to visit a place that was hard to get to, a place that is jeopardized if too many people visit. Wilderness -- whether one of the ones formally designated by Congress in the US, or existing in less formal settings -- is spiritually and psychologically essential in the modern world. It helps pull us back to a more faithful and reasonable understanding of humans as members of Earth community. Drawing on a wide variety of biblical texts, Bauckham (who is a New Testament professor) presents diverging options for how we can live in the world. Encounter with the otherness of nature can be a sacrament of encounter with the greater otherness of God, and, conversely, the common loss of a sense of God in much of modern western society may not be unconnected with the fact that urban life now isolates most people from wild nature, and even from nature only moderately affected by human presence. He warns, "In a world where nothing is untouched by human interference and modification, we shall see only ourselves in everything and feel only pride or disgust, never humility or awe." I've often driven that highway over Vail Pass, and the view of mountains through the car windows is quite pretty. But just two miles from the highway -- huffing and puffing up a hard-to-follow trail through a boulder field at 11,500 feet above sea level -- I definitely felt humility and awe. I felt an upwelling of gratitude, not pride. There are many reasons to protect and preserve wilderness. The Wilderness Society gives a list that mingles the spiritual and ecological with the economic and commercial. I find it a bit jarring to have all of those presented on equal terms. Wilderness and wild places are important as ecological safe places. They are spots where species can exist within unspoiled habitat, and in proper relationship with their surroundings. Large tracts of wild land provide wildlife corridors, allowing the seasonal migrations that have gone on for millennia, and keeping open the possibility of new migration necessitated by climate change. I believe that humans have a moral obligation to leave places intact and relatively untouched, so that wild nature can survive on its own terms. Mountain peaks and lowland prairies, coral reefs and mangrove-covered shorelines, arctic tundra and slickrock deserts -- all of those are blessed parts of God's creation. Too many of them have been destroyed and polluted. What is left must be treasured and maintained. And wilderness needs to be preserved as a gift to humanity. It is there that we can encounter the other on its own terms -- the land, the creatures, the weather. It is there that we can be called back into humility and awe. It is there that we can recognize our own limits. I have been blessed this summer. Good theological reading has brought new understanding, and a challenging hike embodied and accentuated the book learning. May we all be touched in some way by "the non-human sphere", and be moved toward the kind of humility and gratitude that inspire protection and preservation.